Before WordPress 5.0 arrived I came across a few premium WordPress themes already advertising that they were ‘Gutenberg-ready’ or ‘Gutenberg-compatible’. Huh. 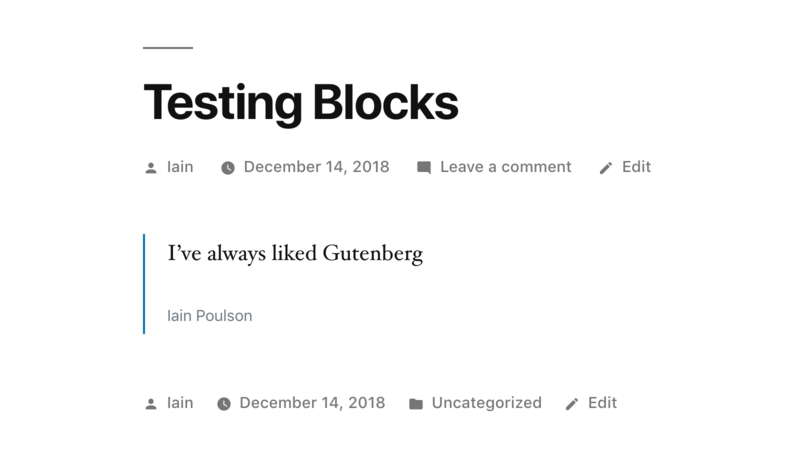 But how could a theme not be compatible with the new block editor (formerly known as Gutenberg)? Surely themes just render whatever is in the post content with the theme’s own styling? Turns out there’s a bit more to it than that. In this post I’ll walk through what is necessary to make existing themes or create new themes that fully support the block editor. 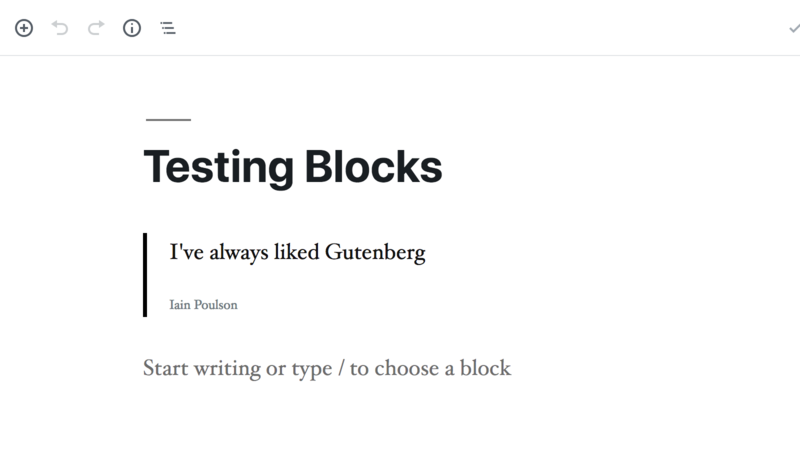 Gutenberg is the new snake oil. There should be no reason why any existing WordPress theme won't work with Gutenberg. After venting on Twitter about theme shops using Gutenberg compatibility as a marketing tactic (pro tip: don’t tweet hangry), I was kindly educated by Rich Tabor about the extra layers of support themes can add to make the experience of the block editor even better. The new Blocks include baseline support in all themes, enhancements to opt-in to and the ability to extend and customize. This guide is a great place to start when making your themes ready for the block editor, but I wanted to pick out a few key areas which I think are important. Editor Styles was introduced back in WordPress 3.0, allowing themes to bundle CSS files that altered how the content was displayed inside the editor, giving users a truer WYSIWYG experience while crafting their content. This approach has been used for years to improve the look of content in the TinyMCE classic editor, but it becomes even more important now with the block editor to get full parity between the appearance of content in the editor and how it is displayed on the front-end of the site. Then create the style-editor.css file in the root of your theme, alongside the main style.css. The content of this new stylesheet is then down to how the theme looks. Block styles aside, you would normally add base styles for typography to match the fonts, weights, sizes and other styles matching the front-end styling. Theme editor styles really make the block editor a truly WYSIWYG editor and gives the user an editing experience that manages their expectations of how their content will look. Twenty Nineteen customizes the width of the editor. It also styles the widget blocks for categories and archives. If you need a full list of all the blocks available in WordPress core then this theme unit testing file has them. Hat tip Morten Rand-Hendriksen. As with most things related to WordPress theme development, the default themes are a good starting point. Use Twenty Nineteen’s editor styles as an example of what can be styled and then tweak it depending on your own theme’s bespoke look. Twenty Nineteen is based on both the _s and gutenberg-starter-theme themes which are well worth checking out. If you’ve used editor styles in the past for the classic editor, it’s important to take a look at how things are different for targeting block editor elements in WordPress 5.0. Color Palettes is a new feature introduced with the Gutenberg project. Some blocks have controls to change colors of elements of the block display. Your theme can also define specific font sizes to be used in the editor, which can help keep control of the font style to your theme’s style. Core blocks include default styles. The styles are enqueued for editing but are not enqueued for viewing unless the theme opts-in to the core styles. Front-end block styling can be as simple or as in-depth as you want it to be and, again, the default Twenty Nineteen theme’s style.css is the best source of inspiration. Twenty Nineteen, as we have seen, was built with the block editor in mind. But what about all the other default themes of the past, which many sites will still be using? Good news, these have all had an update to support blocks in both their editor and front-end style CSS files. I’ve talked about styling blocks in the editor and on the front-end, but, as Morten Rand-Hendriksen asks, what about modifying the behavior of blocks? Block filters make it possible to add further settings to a block. But Morten raises a good point – is this the responsibility of themes? In recent years, functionality like defining custom post types has been moved out of the remit of themes and firmly into the responsibility of plugins. Which is the same for creating new blocks. But is this the same thing? As the block editor, and the ecosystem around it matures, this will become clearer, but I think for now we will see themes altering blocks where necessary. Like with plugin development, the introduction of the block editor has created some challenges and opportunities for theme developers. Themes can really embrace the block editor and give users a seamless experience between viewing their content as they edit and viewing it. Have you already made your themes block editor ready? Have I missed any tips for a successful approach? Are you making your theme’s user experience even better because of the block editor? Let us know in the comments below. This entry was tagged WordPress, Gutenberg, Theme Development, Themes, Block Editor, Blocks.